Raise your Hand. Join the Challenge! The donations of $2,964 made this week can provide nearly 200 hours of legal services to survivors of domestic violence, sexual abuse and human trafficking, as well as a full day of nutritious food to all those in emergency shelter through member agency Middle Way House. Domestic violence, sexual abuse, and human trafficking can affect all people. When there are not enough resources, survivors' requests for a safe place to live, legal representation, counseling, and other supportive services go tragically unmet -- countless times in a single day. In Indiana, last years survivors made 142 requests for services on a given day -- including emergency shelter, housing, transportation, child care, legal representation, and more -- that could not be provided because programs did not have the resources to provide these services. United Way of Monroe County is rallying the community between now and February 28th to “Raise Your Hand. Join the Community Challenge!” The Campaign Cabinet has set a goal for the final month of raising $70,000 to help meet the most critical needs in our community. United Way donors are pivotal in the fight to ensuring low- and moderate-income people have opportunities to improve their lives. Last year over 5,000 received emergency and preventive medical care at no or low-cost; more than 1,100 people – 68% of them children – participated in mental health services; 3,000 at-risk community members – 40% of them children, seniors, or people with disabilities – were provided housing assistance; 400 at-risk people were assisted with budgeting and money management skills; nearly 4,500 children took part in mentoring relationships or high-quality after-school programs; 27,000 hours of tutoring were provided to youth; and 94% of high school seniors in mentoring programs at United Way member agencies graduated on time with a plan for their future. 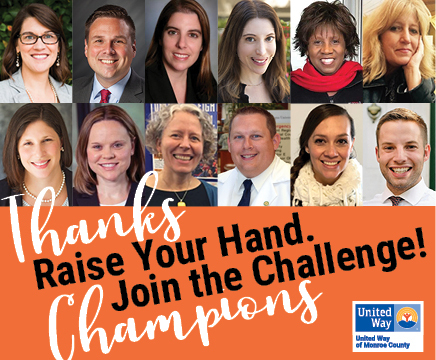 In order to continue sustained support for these and many other life-changing services, a team of Community Champions, led by United Way’s 2018-2019 Cabinet Chair Isabel Santner, will join Cabinet Members in reaching out to individuals and businesses. An online giving campaign and personal appeals will make responding to this invitation easy and seamless. Feb. 22: The donations of $2,964 made this week can provide nearly 200 hours of legal services to survivors of domestic violence, sexual abuse and human trafficking, as well as a full day of nutritious food to all those in emergency shelter through member agency Middle Way House. Why does that matter? Domestic violence, sexual abuse, and human trafficking can affect all people. When there are not enough resources, survivors' requests for a safe place to live, legal representation, counseling, and other supportive services go tragically unmet -- countless times in a single day. Why does that matter? In Monroe, Owen, and Greene counties, 12% of the population lacks health insurance. Without health insurance, preventative care and early intervention for individuals’ medical issues is more likely to be neglected, and individuals are at higher risk of a medical emergency leading to financial crisis. For those with insurance, but of low income, gaps remain in coverage and affordability, such as with dental care. Feb. 1: Donations of $20,500 made this week can provide 3 months of high-quality childcare for 7 at-risk children. Why does that matter? Children who attend high-quality preschool are more likely to succeed in school, graduate, and earn as much as 60% more over a lifetime. At the same time, parents with reliable childcare are more likely to keep stable employment and increase their economic situation. 2018 was a year of uncertainty for charities throughout the nation, with changes to charitable giving tax incentives, a shaky stock market dropping to a low in December, and many worthy opportunities for caring people to engage in issues at home and well-beyond. “A different type of uncertainty impacts our lower-income working families, those who are one car repair or health emergency away from an economic crisis. Our programs for affordable childcare, after and out-of-school care, and mental health care, to name a few, are providing opportunities and hope,” stated Feferman. Of additional concern, Feferman explained, are the impacts of the federal shutdown on disbursement for programs such as SNAP, which may soon drive increased demand towards our agencies. United Way of Monroe County’s mission is to fight for the education, financial stability, and essential needs of every person in our community. United Way impacts the life of one in three local residents. Funds raised today make a direct and real difference on the people in our neighborhoods, at our schools, at the grocery store, and our workplaces. Santner added “We thank each and every individual and business who have pledged support. These funds support tangible things: warm meals and bags of groceries, nights of safe shelter, medical appointments and prescriptions, treatment through a recovery program, affordable childcare or after-school care, job training programs for individuals living with a disability, or home repairs for our aging neighbors, among other things.” The full list of member agencies who receive funding may be found at www.monroeunitedway.org/memberagencies. In addition to this collaborative network, United Way of Monroe County also supports the information and referral resource, 2-1-1, to assure people can connect with the help they need, and a host of other resources for early childhood education and parental engagement, financial literacy and economic stability, and collaborations such as the Nonprofit Alliance to strengthen capacity of area nonprofits, Monroe Smart Start to increase access to high-quality learning opportunities for young children, and the Financial Stability Alliance which supports the Free Community Tax Service, Financial Coaching, Bank on Bloomington, and an array of services and materials related to financial literacy and economic stability. Final results will be shared at the annual campaign celebration on March 28, where participating volunteers, individuals, and businesses will also be recognized. To raise your hand and join the Community Challenge donate online (www.monroeunitedway.org/givenow) or drop off a check or cash contribution at 431 S. College Ave., Bloomington, Ind. 47403. Other ways to give include payroll deduction for those involved with workplace giving campaigns, gifts of stock, and automatic checking withdrawal. United Way of Monroe County improves people’s lives by addressing critical needs today and working to reduce those needs tomorrow. 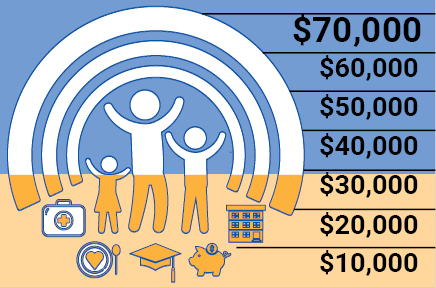 Through its Community Action Fund and grant initiatives, United Way works with 25 member agencies and community partners to focus resources on the building blocks for a better life: education, earning, and the essentials. You can find more information at www.monroeunitedway.org.